Arnold Mathes - "Critical Mass"
A solo synthesizer effort from Arnold Mathes. Arnold being a veteran of the 80's indy cassette scene and was also a part of Alien Planetscapes. 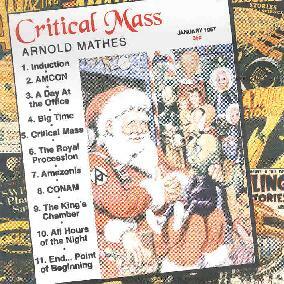 ‘Critical Mass’ is a synthesizer cd. While Arnold also uses movie and TV samples, as well as a few standard instrument sounds (bass, drums), this is primarily electronic. The sounds are mostly non-organic and of the buzzy variety. The tracks are a nice mix of standard arrangements and a kind of retro early 80’s synth thing. The standard arrangements are nicely orchestrated, with a defined melody, bass line, and percussion. While these type of tracks are interesting, it’s Arnold’s retro thing, his approach to the late 70’s, early 80’s synth music that is the best part of this cd. These tracks feature noticeable sequencer parts, the kind we heard on recordings from Tangerine Dream, Larry Fast, and Klaus Schulze. The additional electronic instrumentation in these tracks gives them all a familiar feel. A little tug in the back of the head that says I’ve heard this before. A very pleasant piece. I really didn’t like it at first. Too commercial, too derivative, too something. After a number of listenings, I found myself liking it more and more. I think it was that familiar buzzy synth thing that did it for me.